Announcer-Free TV? Detroit's Baseball Fans Say Yes, Please : The Two-Way The only voices in a TV broadcast of last night's game between the Detroit Tigers and Washington Nationals came from the field and the stands. FOX Sports Detroit offered fans "Natural Sounds at Comerica Park" as an alternative to its regular telecast. Detroit Tigers shortstop Jhonny Peralta bats during the sixth inning against the Washington Nationals on Tuesday. Detroit fans watching game had the option of tuning in to a broadcast that lacked announcers, featuring only the sounds from the stadium. Baseball fans often declare their love of the game's rhythm, its quiet pauses and bursts of action. For such people, watching a game on TV can be a struggle, particularly if they're annoyed by the chatter of announcers. Fans in Detroit had another option last night: watching a TV broadcast that included only the natural sounds of the ballpark. 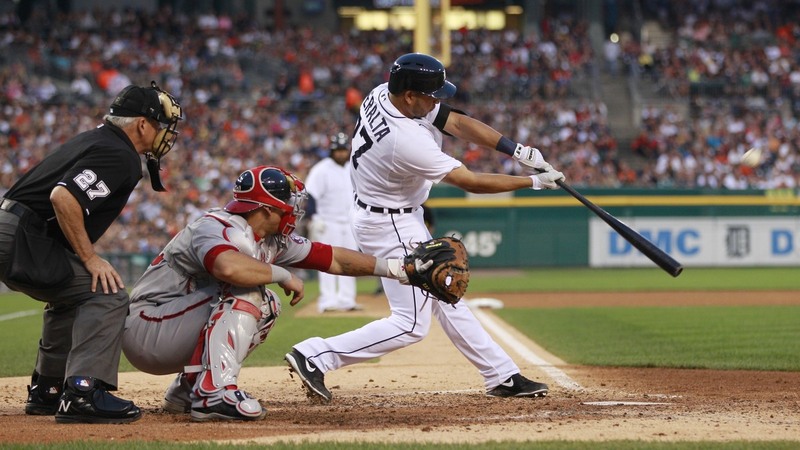 On its "Plus" channel, Fox Sports Detroit offered fans a feed of Tuesday night's game pitting the Tigers against the Washington Nationals, titled "Natural Sounds at Comerica Park." The program's only voices came from the field and the stands. The broadcast was enhanced by "extra microphones around the park so viewers can hear more of the sounds of baseball — the bat cracks, ball popping in the mitt, vendors chiming in from the stands and the crowd's reaction to every play on the field," said Fox Sports Detroit's general manager, Greg Hammaren. As the Awful Announcing site notes, the move was a hit with many viewers, who took to Twitter to call the broadcast "awesome." Others said, "Wish it was like this every game." The experiment by Fox Sports Detroit follows in the footsteps of the famous NBC broadcast from 1980, when an NFL game between the New York Jets and the Miami Dolphins was aired without announcers providing play-by-play commentary or analysis. And as large and complex events such as the Olympics and soccer's World Cup broaden their online offerings, fans can often find live streaming video of competitions that include only the ambient sounds of the arena. Fox Sports Detroit will have another announcer-free game at the end of August. But Awful Announcing's Matt Yoder says fans shouldn't expect to see such games on a regular basis. "There's a reason the play-by-play man has had a job for decades — game broadcasts usually need a narrative and layer of context to what's happening on the field," Yoder writes. "More importantly, we'd be out of a job." Still, he adds, "one also wonders if Fox would ever look into the 'natural sounds' feed for the World Series given the, ahem, 'popularity' of Joe Buck and Tim McCarver with many baseball fans."